The satchel might have first originated with the Roman Legions, but the late Renaissance helped it come into fashion in England. As the cultural movement swept across Europe, education became Increasingly coveted and English students found the single-strap design especially useful for carrying papers and books. Students weren't the only ones who found the design smart. They also became favored by military and postal messengers from the Pony Express and World War II, giving the bag a distinctly masculine persona. But that might be changing up this summer as three designs combine the satchel idea with a smaller tote. All of them have added the functionality of a side strap, along with handles. And they all have contrast lining on the inside. Fossil Releases A Vintage Reissue Drawstring With Its Hobo Collection. The semi-modern retro appeal has little in common with with those from Middle English, old French, and late Latin. Fossil borrowed from the 1970s to create a vintage appeal without sacrificing function. Fossil. The two newest designs in Fossil's hobo handbag collection include grounded, natural colors. The canvas (above) and color cotton (right) are more striking than their leather counterparts. All of them have an internal lining to help the bag keep its shape and they include an internal side pocket (with zipper) for phone and PDA. Another interesting feature, which other designers have followed, is adding hardware to the bags, making them look much more casual and rugged at the same time. The bags have a 22-inch length with the strap and 11-inch length with the handle. Fossil says its hobo line is characterized by its crescent-like shape, which gives it a relaxed look. George Gina & Lucy. Although slightly different, Fossil isn't the only designer looking to revive the women's satchel. One up and coming handbag designer based in Germany carries a similar look. Made of a high quality cotton/nylon blend, the bag loses the crescent shape in favor of a mini-duffle. The bag, which they consider a tote, features silver hardware and several interior and exterior pockets. Some pockets zip and others button. Two of the interior pockets are open; one is zipped. We spotted the Olive Sun Oil from George Gina & Lucy at National Jean Company. Overall, it's a much a bigger bag than the Fossil design. Billabong. Billabong also relied on a Seventies feel to bring its "lay low" handbag to life. The Billabong Lay Low Buckle Bag has a burlap exterior with a tribal screen print and vegan leather trim. Like the other designs, it has a small zip pocket on the inside with a contrast lining. What sets the Billabong bag apart from the other two is easily the price. But don't let the product shot fool you. The bag's shape resembles a tote with a longer strap (once you add a few items). The Billabong logo is metal, and hidden under the drawstring. Fossil Also Carries Some Great Vintage Satchels. I suppose some people might argue that the women's satchel could be considered a tote (with a longer strap) or hobo (with its slouchy look). But the truth is that the original satchels didn't take their messenger bag shape until much later. Even the famed satchel that was somewhat popularized by Indiana Jones movies was a late design. Although the original movies placed him in the 1930s, fan researchers note that Indy's bag is loosely based on the MKVII gas mask bag used by British military personnel and British civilians in the 1940s. It was also the preferred shape by messengers and mail carriers. It's still the most popular style employed by bicycle messengers in London (even if many have added stabilizing straps help to prevent the bag from shifting while riding). If you're interested in a classic satchel, Fossil carries some of the best courier and messenger models. Most of them feature coated twill canvas and soft vintage leather. Like most messenger bags, it includes several pockets under the flap. But unlike most, the interior is padded for laptops. The Fossil Hobo Design Carries A 3.8 On The Liquid Hip Richter Scale. If you like the bags, the detail to look for is in the lining. The smarter designs are waterproofed on the inside, even if the offside is not. If you find the side straps to be too long, shoemakers can usually shorten them for added comfort, allowing the bag to fall where you like. 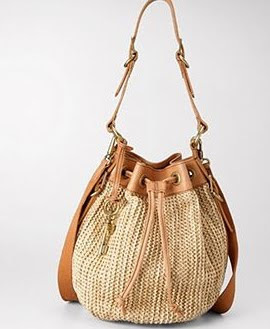 The Vintage Re-Issue Drawstring is available direct from Fossil. They range from $128 to $188. The George Gina & Lucy Olive Sun Oil is available from the National Jean Company ($227).